Become an engineer from day one. Your academic journey begins by working in teams to create innovative solutions to real-world problems in the First Year Engineering Projects course. Join workshops and courses in the Integrated Teaching and Learning Program that promote teamwork as well as technical and problem-solving skills. Expand your engineering expertise through undergraduate research opportunities working with cube satellites, bio-inspired tech, or wearable devices. With so many hands-on experiences, you’ll be prepared to develop your senior capstone project and launch your engineering career. The act of reaching your fullest potential by surrounding yourself with a community that willsupport you, participating in experiences that will challenge you, and living in an environment that will inspire you. Located at the foot of the Rocky Mountains, the city of Boulder is a leading force in research, technology, and entrepreneurship—a place where innovation happens. 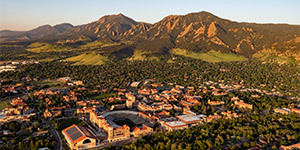 At the heart of the city, CU Boulder produces some of the best and brightest in these industries and is a primary source of Colorado’s highly skilled workforce. Our talented faculty, students, and alumni are leading the way for the next generation by inspiring innovative, humanitarian, and social enterprises. At the cornerstone of your experience are our innovative academicprograms, fueled by experientialopportunities and active learning that will prepare you for a complexglobal society. 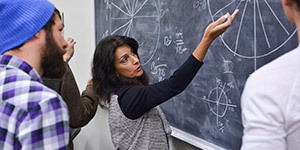 Within our supportivelearning community, you’ll interactwith our faculty—who include NobelLaureates, MacArthur Genius GrantFellows, US Professor of the Year awardees, and National Medal of Sciencewinners—who will be listening, questioning, and helping you refine yourideas so you can develop a broad understanding of the world, strong leadership skills, and an enhanced ability to think critically. 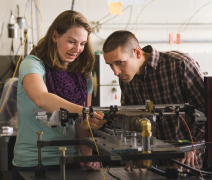 Within CU Boulder’s College of Engineering and Applied Science, undergraduate research and hands-on projects starting your first semesterprepare you for careers with top science and engineering companies thatregularly recruit on campus. You cantailor your degree to fit your interests, whether it’s in business and entrepreneurship, teaching, engineering for the developing world, or the intersection of technology and art. At CU Boulder, the hard work happening in our classrooms, labs, recital halls, and studios is complemented by the remarkable beautythat surrounds us. Appreciation for our iconic Rocky Mountain localecomes easily in Boulder, and as a result, we have one of the most active college campuses in the nation,where recreation, sports, and studentgroups play key roles in the unique CU Boulder experience. Within our inclusive community, you’ll find many ways to get involved and make lifelong friends. And you’ll have the opportunity to serve the greater good through volunteerism and civic engagement, whether it’s around the world or across the street. CU Boulder graduates continue to Be Boulder as they enter the workforce or begin their graduate school education. With their hands-on experience, world-class education, and the ability to think critically, globally, and creatively, they benefit from a strong salary potential, high employment rates, and the opportunityto find and excel in a career they’re passionate about. Live in spectacular surroundings and learn in a campus environment of extraordinary opportunities. Come to CU Boulder and discover who you can be.